With October’s list being like a mountain here are three little gems to curl up with it on these frosty evenings. Imagine it is almost December!! Anyone with Irish book releases in December, please let me know asap. The details of featured books go to two successful online magazines, Self-starter.ie and Indulgeme.ie. Some November releases have slipped through my new releases radar. If you’ve been omitted please mention it and I will add your book. By Royal Appointment A O’Connor. Poolbeg Press releasing this 1st November! In 1861 nineteen-year-old Bertie, Prince of Wales, began an affair with the Irish actress Nellie Cliffden. 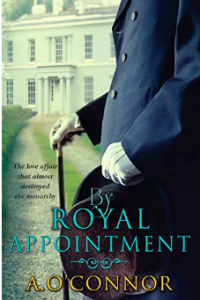 By Royal Appointment is a fictionalised account of their story, based on true events. 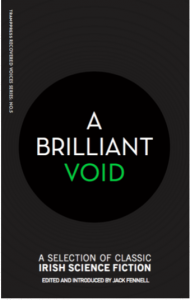 The Brilliant Void collection of stories by Tramp Press. An astronomer challenges an emperor. A hunter pursues the last dinosaur through a remote rainforest. A young Kerryman emigrates to the Moon to seek his fortune. A Brilliant Void as the fifth in Tramp Press’s Recovered Voice list. JANE BARLOW (1856–1917) was born in Dublin, the daughter of the Vice-Provost of Trinity College. She wrote under a couple of different pseudonyms, most notably Felix Ryark and Antares Skorpios, and her work includes the philosophical space-voyage story History of a World of Immortals Without a God (1891), and the ‘lost world’ novel A Strange Land (1908). FRANCES POWER COBBE (1822–1904) was an outspoken social reformer who campaigned for women’s suffrage and advocated for animal rights; she was a founder of the National Anti-Vivisection Society and the British Union for the Abolition of Vivisection. Cobbe was a regular correspondent with Charles Darwin, and wrote extensively on the moral implications of his theory of evolution. She is buried beside her partner Mary Lloyd in the cemetery of St Illtyd’s Church in Gwynedd, Wales. CLOTILDE (‘CLO’) GRAVES (1863–1932) was born in Buttevant, Co. Cork, and published her first novel at the age of forty-six, under the pseudonym ‘Richard Dehan’. Prior to this, she was also a playwright, a freelance journalist and a cartoonist. During her lifetime, she was perhaps best known for her controversial 1911 novel The Dop Doctor, which lionised the British side of the Second Boer War (1899–1902). MARGARET WOLFE HUNGERFORD (1855–1897) was born in Rosscarbery, Co. Cork, and later married a Dublin solicitor. Her first novel was written to support herself and her three young children following the sudden death of her husband. She is perhaps most famous as the originator of the phrase, ‘Beauty is in the eye of the beholder,’ which first appeared in her second novel, Molly Bawn(1878). DOROTHY MACARDLE (1889–1958) was born in Dundalk, Co. Louth. She studied at University College Dublin, and subsequently taught English at Alexandra College, the girls’ school at which she herself had been educated. Although she was best known as the author of The Irish Republic (1937), her 1942 novel Uneasy Freehold – adapted to film as The Uninvited (1944) and subsequently published under that title – is now acknowledged as a modern classic ghost story. WILLIAM MAGINN (1794–1842) was a native of Cork and a prolific writer of short fiction. A resident of London from 1824, he was a frequent contributor to various newspapers, and in 1836 he fought a duel over the fallout from a negative review he had written of a Whig MP’s debut novel. Also of genre interest is his 1827 novel Whitehall, presented as a historical novel about the 1820s from the year 2227. CHARLOTTE ELIZABETH (‘L’) MCMANUS (1853–1944), a native of Castlebar, Co. Mayo, is best remembered today for her novel The Professor in Erin, originally serialised in Arthur Griffith’s Sinn Féin Weekly in 1912. She also helped to establish the second branch of the Gaelic League in Co. Mayo, and was a member of the Irish Literary Society. L.T. MEADE, or ELIZABETH THOMASINA MEADE SMITH (1844– 1914), was a prolific author, mostly of children’s stories. She was born in Bandon, Co. Cork, and later resided in London. She was also a member of the Pioneer Club, a progressive feminist group based in London. FITZ-JAMES O’BRIEN (1828–1862) was born in Cork, and grew up in Castleconnell, Co. Limerick. He emigrated to the US in the early 1850s, and later fought for the Union in the American Civil War. TARLACH Ó hUID (1917–1990) was born Augustus Walter Hood, after his father, in London. He was a member of the Social Credit Party of Great Britain and Northern Ireland, and later a member of the IRA. For his IRA activities (mostly pamphleteering), he was jailed from 1940–1945, and he continued working for the Gaelic League after his release. ART Ó RIAIN (1893–1968), a native of Thurles in Co. Tipperary, was a civil servant who wrote under the pseudonym ‘Barra Ó Caochlaigh’ (since civil servants were not permitted to publish under their own names at the time); under this name, he wrote the Oireachtas Literary Award-winning sci-fi novella An Tost [Silence]. He went on to write for the state Irish-language publishing company, An Gúm. CATHAL Ó SÁNDAIR (1922–1996) was born in Weston-super-Mare, and published his first Irish-language short story at the age of sixteen. He is reputed to have written 160 books for schoolchildren, featuring the intrepid detective Réics Carló, the cowboy Réamonn Óg, and the space-pilot Captaen Spéirling. Æ (GEORGE WILLIAM RUSSELL) (1867–1935) was born in Lurgan, Co. Armagh. A poet, political activist, novelist, essayist and painter, he appears as a character in James Joyce’s Ulysses. His pseudonym ‘Æ’ was abbreviated from the word ‘Æon,’ and reflects his spiritualist beliefs. 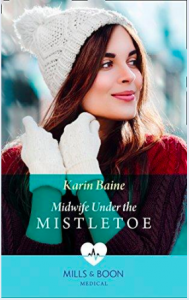 Midwife Under the Mistletoe (Mills and Boon) by Karin Baine. Out now. 1st November. GP Fraser McColl longs to be part of a loving family, but past experience has taught him he’s better off alone. Only when he’s thrown together with gorgeous yet guarded midwife Iona Munro, to care for two children at Christmas, he’s tempted to believe in miracles… After one passionate night together, can he persuade Iona that they deserve a lifetime of happiness—together? Midwife Under the Mistletoe. Mills Medical ebook by Karin Baine. And my next book The Healer will be available to pre-order soon.